STRATI CONCEPT CREATED THE FOTOSETS INCLUDING LETTER BOARDS AND ACCESSORIES IN 1994. With the aim to face the reality in the field we have developed well-equipped fotosets, grouping together in a transport bag all the accessories required for the making of archaeological photographs. 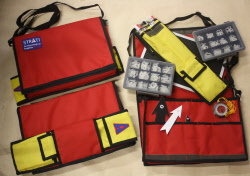 Our very compact transport bags ensure maximum protection of your material and greatly facilitate its use in the field thanks to individual compartments for each element. Created and manufactured in our workshops in Guengat (Finistère, France).